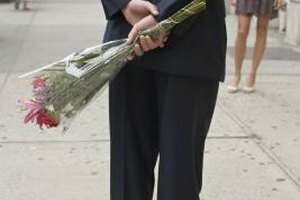 Romantic gestures may help win a woman back. "I want to take a break." These are difficult words to hear from your partner. Whatever the reason for the separation, you need to respect your partner's right to step back from the relationship and work out what she wants in the long run. That doesn't mean you have to sit back and do nothing. Do what you can to fix what was wrong with the relationship and try to make your girlfriend fall in love with you all over again. Be there as much or as little as your girlfriend wants. She might not want any contact with you while you are taking a break, and you must respect this. Pestering her at this point will make her feel as if you are not listening to her needs, making her less likely to give the relationship another chance. If she wants to talk about what went wrong, however, make sure you are there to listen. Let her vent and get everything off her chest. Licensed psychologist Guy Winch recommends telling your girlfriend you understand why she feels the way she does and that her feelings are completely reasonable. If you manage to win her back, there will be a time for you to get your point of view across. For now, however, try to listen and understand without arguing or getting defensive. Agree with your girlfriend that you want to change your relationship for the better, advises Susan Heitler, who holds a doctorate in clinical psychology. If she knows that you are willing to make the necessary changes to improve your relationship, she is more likely to consider a reconciliation. If your girlfriend wanted to take a break because she doesn't think you are romantic enough, for example, make a gesture she won't expect, suggests international dating website eHarmony. Send her a bouquet of her favorite flowers with a card saying "Thinking of you." Email her a cute picture or video clip with a message saying it made you think of her. Give your girlfriend the chance to miss you. There is only so much you can do to win her back. Ultimately, she will make up her mind. Be there for her if she needs you, but spend time with your friends and get on with your life. Don't sit around pining for her. Take the time to think about how you could improve the relationship if you get back together. If you stay strong and make positive changes in your life, she may remember what attracted her to you in the first place, Heitler says. What Are the Consequences of Cheating on Your Girlfriend?